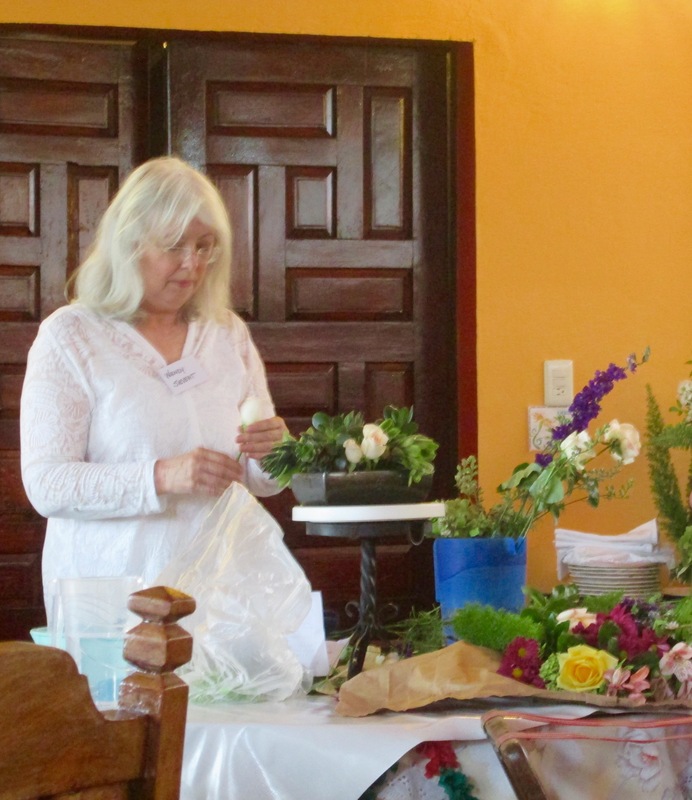 It may be that whenever – and wherever – older, retired women get together and pool their creative talents, as well as their other considerable abilities and resources, good things happen in their communities and the surrounding areas of wherever they live. Like pebbles in a pond. Perhaps this is universal, everywhere in the world. Maybe it’s even a cliché. But I am here now, as a recently retired older woman, living in San Miguel de Allende, Mexico; so I can only speak (and write) about my experience here as to what such women can do. Scholarships. Where, I wondered as I read this, would I be if I hadn’t been given scholarships? Out of high school I’d won a full scholarship to The Katherine Gibbs School in Montclair, New Jersey, where I learned a then-useful trade (shorthand, typing, telephone-answering, filing…), as well as ladylike comportment. Years later, when I was thirty, I won a full scholarship from the Helena Rubenstein Foundation to attend Columbia University in New York, where I learned how to read and write and think and question and strive to contribute to the common good as a responsible, intelligent citizen in this complicated world. Without those scholarships and the education and exposure they afforded, I would not be who I am. I would not have written three books and taught at the university level. I would not be here. I would not be writing this blog. I would not have gone to the Mujeres en Cambio luncheon last Thursday. But I did go, and I’m glad I did. 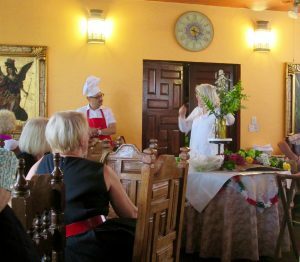 Sitting there in the packed dining room of the lovely Hacienda de las Flores, among what looked like close to one hundred white- and gray-haired women dedicated to helping younger women get ahead in the world, I felt proud. This is what women can do, I thought. This is what they (we!) can – and do! – do with our hearts and minds and time when circumstances free us up, when we’re no longer in the work force, no longer bearing or caring for small children, free to be “ladies who lunch” with a purpose. 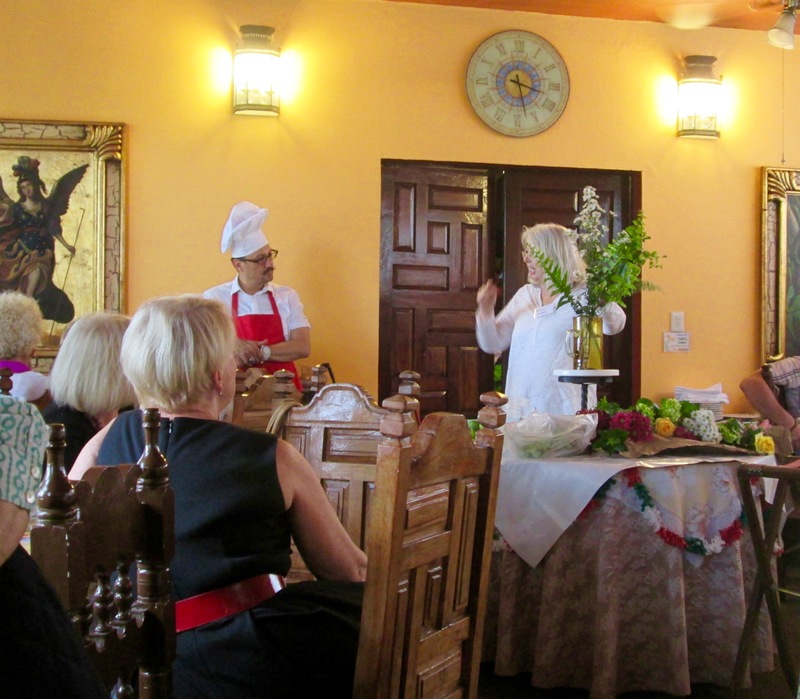 The cost of this luncheon, billed as “An Italian Feast!” was only 300 pesos (or about $16 U.S.), the food was (as promised in the newspaper article) delicious, and a special draw was a floral-design demonstration by local artist and designer Wendy Sievert. The three arrangements she created – explaining her special secrets and techniques as she went – were raffled off to earn even more funds for this good cause. Mujeres en Cambio’s efforts to help provide higher education for worthy young Mexican women reminded me, too, of a T-shirt my friend Youssef proudly wore in Gabon when I served in the Peace Corps there. It was a black cotton T-shirt with the profile of an African woman’s face outlined in white on the front. The T-shirt read in French, “Teach a woman and you teach a country.” The same, I thought at this luncheon, is true in Mexico – and everywhere else in the world. Mujeres en Cambio is one of dozens of nonprofit organizations in San Miguel de Allende dedicated to helping the indigenous people of this community and the surrounding area. For further information about it, please go to: mujeresencambio.org. Thank you, dear Arti. Wish you could have been there, too. You would have loved it. Check out their website! Of course you saw to the heart of things as we sat in the crowded dining room of Mujeras en Cambio. At first it seemed like a group of privileged women…..but in talking with the women at our table..it seemed quite different…ordinary women, some with limited means, simply wanting to help other women climb the ladder out of poverty and make a better life for their families. In my case, my seemingly old-fashioned father supported my entrance into the university because, even in his time, he believed, “educate a woman and you educate the world”….saludos to him ….to Mujeras en Cambio and to you, darling friend! What an inspiration, Bonnie. Thank you for sharing this with me. Maybe we Taoseñas can start a Mujeras en Cambio aquí! Thank you, Barb dear! Yes, wouldn’t it be wonderful if every town and city had one! I hope to visit other, similar nonprofits’fundraising events here and report on them as well. So glad to see that you were at the Mujeres en Cambio luncheon. I had intended to go, but then got side tracked. A dear friend of mine and her friend – both now deceased – started that NGO and many others long ago. SMA has over 110 NGOs – the most of any place in Mexico……..and possibly the Americas, for all I know. One can stay very, very busy participating in all there is to do here. Mujeres is definitely one of the groups that I support every chance I get!